Chapo bribery a tall tale? Mexico City—Did the world’s most famous drug lord really pay Mexico’s ex-president a $100-million bribe not to arrest him? The claim, made by a witness Tuesday at the trial of Joaquin “El Chapo” Guzman, stretches credibility, experts say—starting with the fact that it would take a truck to transport that much cash. Colombian drug trafficker-turned-state witness Alex Cifuentes surprised the courtroom in New York—and caused a firestorm of controversy in Mexico—when he alleged that “El Chapo” had paid the bribe to then-president-elect Enrique Peña Nieto in 2012. But while there is no doubt that Mexico is awash in all the ingredients of the story—drug money, corrupt officials, powerful kingpins—there are many reasons to doubt it, according to people who know the murky nexus of politics and narcotics. “It would have been the biggest bribe in all of history. I’ve been with DEA [the US Drug Enforcement Administration] for 31 years, I’ve seen bribes of millions of dollars, hundreds of thousands of dollars, but certainly not a bribe like that,” said Mike Vigil, former head of international operations for the DEA. After Cifuentes made the accusation, Peña Nieto’s supporters rushed to argue that the former president (2012-2018) was the one who made sure “El Chapo” was rearrested after his brazen prison escape in 2015, then extradited to the United States. There are several reasons to question Cifuentes’ story. He also provided no proof and admitted he was unsure about key details, including the amount and the date. Then there is the fact that the information comes second-hand: Cifuentes said: “El Chapo” is the one who told him the story, in which he purportedly gave the money to a woman named “Comadre Maria” to give to the president-elect shortly before he took office. 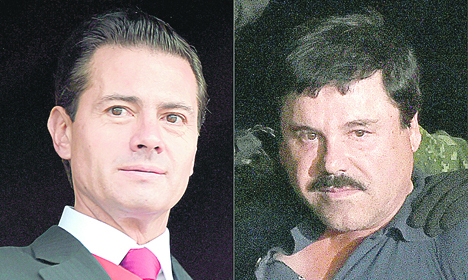 Both Guzman’s stories and Cifuentes’ have shown a certain flare for drama as they have emerged in court. On Wednesday, Cifuentes testified that “El Chapo” was once tortured by army soldiers who dangled him upside-down from a helicopter to find out where his drugs were. Finally, there is the fact that the bribe story emerged during questioning by Guzman’s own lawyers— who have sought to portray their client as a scapegoat for corrupt officials and the man they say wields the real power in the Sinaloa cartel, Ismael “El Mayo” Zambada.